In this collection of masterful stories, steeped in realism, James Joyce creates an exacting portrait of his native city, showing how it reflects the general decline of Irish culture and civilization. 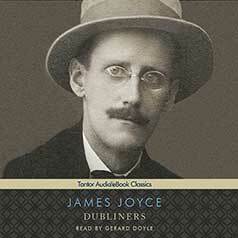 Dubliners is a collection of short stories by James Joyce that was first published in 1914. The fifteen stories were meant to be a naturalistic depiction of the Irish middle-class life in and around Dublin in the early years of the twentieth century. The stories were written at a time when Irish nationalism was at its peak and a search for a national identity and purpose was raging; at a crossroads of history and culture, Ireland was jolted by various converging ideas and influences. They center on Joyce's idea of an epiphany: a moment where a character has a special moment of self-understanding or illumination. The initial stories in the collection are narrated by children as protagonists, and as the stories continue, they deal with the lives and concerns of progressively older people. This is in line with Joyce's tripartite division of the collection into childhood, adolescence, and maturity. The stories contained in Dubliners are "The Sisters," "An Encounter," "Araby," "Eveline," "After the Race," "Two Gallants," "The Boarding House," "A Little Cloud," "Counterparts," "Clay," "A Painful Case," "Ivy Day in the Committee Room," "A Mother," "Grace," and "The Dead."